Stan Lee, co-creator of Marvel Comics, passed away in Los Angeles on Monday at the age of 95, prompting a number of Korean fans to mourn the loss of the legendary icon. The creator of Marvel characters such as Spider-Man, the Fantastic Four, Hulk, Iron Man, the X-Men, Black Panther, Thor and many more had been suffering from pneumonia, according to media reports. 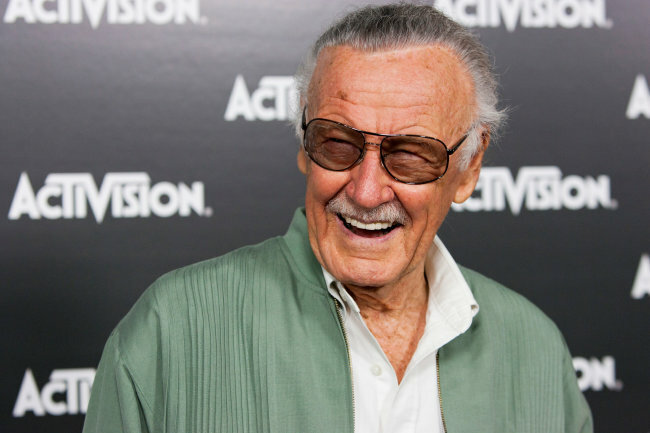 As his death was confirmed, the name “Stan Lee” shot atop the rankings of Naver’s trending bar at around 4:20 a.m. Tuesday, and the keyword remained there as of 4:10 p.m.
“Stan Lee, the founder of many Marvel comics and the best cameo of the Marvel Cinematic Universe, departed this life on Nov. 12. Rest in peace,” a Twitter user wrote, capturing the Google profile of the writer. The tweet was shared over 9,100 times in 12 hours. Searching for “Stan Lee” on Facebook, hundreds of posts pop up grieving for his death. “I would feel sad if I can’t see him again in Marvel movies anymore. Rest in peace,” a Facebook user wrote. The cultural icon appeared in a cameo for the first time in a Hulk TV movie in 1989, and the Lee cameo became a hallmark of Marvel movies as he appeared in almost every film in the Marvel Cinematic Universe, including the most recently released “Ant-Man and the Wasp” in July. “The hero of all heroes has passed away ... I still can’t believe it,” another Facebook user wrote. Many fans wrote “Excelsior!” in comments below posts. The Latin word meaning “higher,” or “ever upward,” was Lee’s famed catchphrase.